In Austin, I found these three components but in a very casual and unique ambiance, filled with young people and with a great vibe. Today I share with all of you my two-day itinerary in Austin, TX, a city that's located only two hours and a half away from Houston, thus it's perfect for a short and fun road trip. My husband and I arrived in Austin on Saturday at lunchtime, so we decided to go directly to the very trendy Café No Sé. At Café No Sé you'll find a very colorful restaurant with a homey feel, located inside the South Congress Hotel. They are opened all day and are famous for offering Rosé with breakfast, lunch, and dinner. We really enjoyed the grilled shrimp burger with spicy mayo and bok-choy slaw, as well as the yellow fin tuna poke bowl, served with brown rice, Castelvetrano olives, pickled jalapeño, pistachio, grapefruit, and shrimp chips. When we found out that the restaurant's Chef, Amanda Rockman, had won many pastry awards, we ordered the Rice Pudding with coconut ice cream and mango cloud. Spectacular! After a great start to our trip, and thanks to the recommendations of Lilia Davis, the editor of the Revista Mujer magazine, we decided to go visit the Blanton Museum at the University of Texas. The Blanton Museum is located inside the premises of the University of Texas and has one of the biggest art collections of central Texas with over 17.000 pieces from different eras and regions. At this museum, you'll also find one the most important pieces from American Artist Ellsworth Kelly titled “Austin.” A stone building surrounded by colorful glass windows and a wooden sculpture right in the middle. It's without a doubt a very spiritual place with an incredible energy, similar to the Rothko Chapel in Houston. After driving Austin's hills up and down, something fantastic as Houstonians, we arrived at the peak of Mont Bonnell inside the Covert Park. This Mount is known for having one of the most beautiful views of the Colorado River that flows into Lake Austin. Climbing up the steps was totally worth it because, at the top, the view is truly spectacular and perfect for taking lots of pictures. Since we went on graduation weekend, it was really emotional to see a lot of UT graduates enjoying Austin's wonderful landmarks with their families. After a perfect day filled with art, nature and delicious food, we went to our hotel to rest for a while before heading out for dinner. 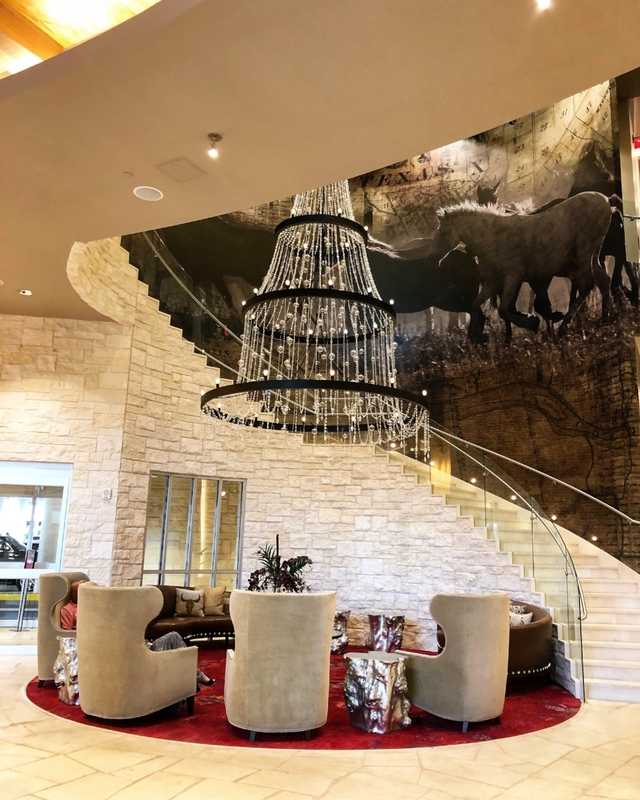 We stayed at the beautiful boutique Archer Hotel located at The Domain, a new retail and restaurant development north of Austin. For me, the most important thing during a hotel stay is the attention to detail, and at Archer Hotel they were masters at it. Archer Hotel is decorated with a fun and original Texas Chic style. They have a magnificent chandelier that welcomes you at the Lobby, fun murals of various artists around every corner, and beautiful cabanas surrounding the pool that makes you want to stay and sunbathe all day. We stayed in a Balcony Suite that had a modern yet elegant style. It was filled with details like toiletries from Malin + Goetz, an amazing New York-based brand, the linen and bathrobes from Frette, a luxurious Italian brand and a Nespresso coffee machine to wake up to the unbeatable coffee aroma every morning. Thanks so much to Archer Hotel for hosting our wonderful stay. Archer Hotel - 3121 Palm Way, Austin, TX 78758 - Special rate for Yo Mariana readers using code YM15. After a well-deserved rest at the hotel, we decided to go out for dinner. At Justine's Brasserie, Chef Taylor Chambers creates a perfect harmony between his southern roots and the traditional French cuisine. We enjoyed a super fun dinner with a very casual ambiance. We ordered the Confit de Canard or duck accompanied by oven potatoes and a Frisée salad with lemon dressing and the Steak Frites with a delicious Roquefort sauce. Everything was outstanding. To finish our 24 hours in Austin on a high note, we enjoyed a delicious Sunday brunch at Hillside Farmacy before driving back to Houston. This restaurant's decor is really unique since it recreates an antique apothecary. We had a southern breakfast that included a Fried Egg Sandwich with avocado, aioli, sprouts and a fried green tomato and the traditional Ham & Cheddar Cheese Grits with a demi-glassed mustard, arugula, and two fried eggs that were amazing. Also, at this restaurant, I discovered a local Serrano sauce called Yellowbird, I'm so obsessed with it that now I can't live without it in my pantry. We came back from Austin feeling so happy that we had the chance to escape from our daily routine for a couple of days, and we will definitely go back soon to continue the journey of discovering amazing places and restaurants in Austin. I recommend you stay at Archer Hotel and if you use the code YM15, you'll receive a 15% discount. *Archer Hotel provided me with a free hotel night; however, all opinions and photographs are my own.